I'm looking for a flight search engine that lets me search for a flight from a specific origin to a specific destination. I don't care on which weekend the flights take place, but I want to find the cheapest flight in the next 2 months that leaves one a Friday afternoon evening and returns at Sunday night or Monday morning. I couldn't find such a flight search engine. Is there anything like that? Search for an itinerary on Google Flights including the origin and destination on Friday and Sunday. Apply the filters for departure time (Friday after 5pm, say; or Sunday after 4pm). Click on the first date field. Look at the numbers for all Fridays from then onwards. Those should be the prices on those Fridays, for 2 day trips, with all of your filters present! 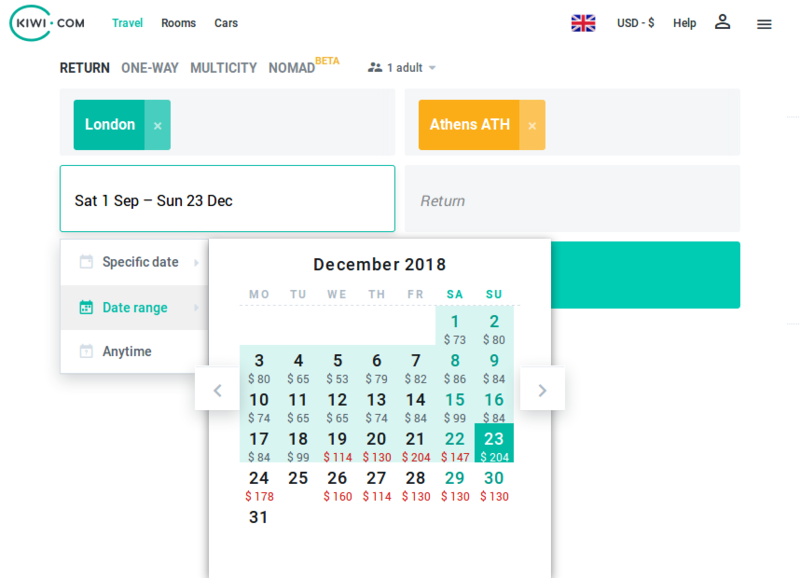 Select the cheapest and book it. Note that you'll have to repeat this twice, once for Friday - Sunday departures, and once for Friday to Monday, but Google Flights is absurdly fast, so you should be good. First enter your origin and destination cities. 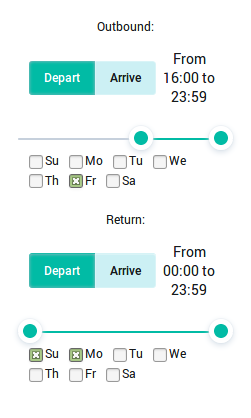 Next, as the departure date, enter a date range over the whole period you are looking for weekend getaways. It can be over a period of several months. The results will be automatically updated. Note that since we want to include both flights that return late on Sunday and early on Monday we had to leave the return time filter at all day. This will lead to some results that are not relevant, like returning early on Sunday and late on Monday. So ignore them. Or to avoid those unwanted results, first filter for only Sunday evening, and next for only Monday morning. I had the same exact thought as you a few years ago and created a site to make those searches. It worked for years but then Google shut down the API I used to make my searches. My hacky fix was to add a Search Kayak button at the top of the page that opens a bunch of Kayak windows, each one a week after the previous window. Give it a try! It takes a while for all the Kayak windows to load. Not the answer you're looking for? Browse other questions tagged air-travel online-resources flight-search-engines or ask your own question.